On last week’s blog, we learned that we need to go back to caring for ourselves and giving importance to our back health. Your back is one of the most important muscles in your body, and like what we also shared about gut health — our back health influences the health and wellness of other areas in our body. If you’ve been experiencing any sort of back pain, or if your shoulders and neck are beginning to feel tight and easily tired, yoga offers several opportunities for therapy, relaxation, and strengthening of your back muscles and bones — especially for someone who is experiencing a growth period in their life such as adolescents and teenagers. One condition that is persistent in persons of this age, which yoga can particularly address is scoliosis. Scoliosis is a sideways curve of the spine, whereas a healthy spine should have no sideways curves at all. Children and young adults that suffer from scoliosis can experience different symptoms such as frequent tight chestedness, imbalance, or back aches due to “bad posture”, and if not addressed these could worsen over the years as they age. Again, movement is key. If you think that stagnation will benefit your back, you will quickly find out that this is not so. Our bodies actually need movement for bone and muscle health. However, the right movement is essential. Here are 5 very simple yoga poses that can help strengthen and support you or your young one’s back, specifically for those with scoliosis. Tuck one foot in and extend one leg out. With a flat back, lower your head as close to your knee as possible. Do not crunch your head forward; instead think of it as an extension of your spine. Forward bends like the Janu Sirsasana helps release tension in the back and shoulders. Should you be comfortable enough, lower your head even more until it touches your knee and this will give you a deeper release. 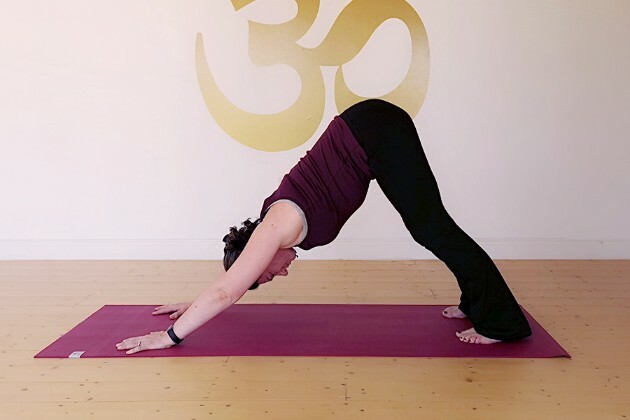 Stand in Mountain Pose and gently walk your legs apart shifting your toes to face the front of your mat and slowly bending into a flat back position. Maintain the strength and heat in your core. Although a little more intermediate than all other poses, Parivrtta Parsvakonasana is a wonderful way to activate your lower spine and strengthen your mobility through the rotation of your spine. This helps improve balance from your torso and legs. A wonderful anchor for your breath practise, Cat-Cow involves flexing your spine like a kitty cat and then extending it down to mirror the belly of a cow. This flexing and extension of the spine can incredibly help improve circulation between your vertebrae. The motion is very simple, but massively beneficial especially if you spend most of your day seated. The movement that you provide your bones and muscles in this stretch can prevent back pain and is an amazing tool for maintaining a healthy spine. After Cat-Cow, lower to your belly and gently lift your upper body. Be aware of the muscles that you are using on your back and support yourself with your hands and arms. This post increases the flexibility of your lower back and opens your heart to encourage strong circulation throughout your entire body. Finally we end with one of the first poses you will ever learn and a wonderful tool for your back’s alignment — from Cobra Pose, nail your abdomen to your spine and scoop your bottom up, opening your chest and activating your arms. Ensure that your neck and head are one beautiful line extending from your spine. Experiment with bending your legs and straightening them — pinning your feet to your mat. Notice the change in feeling. This, one of my most favourite poses, gives a yummy stretch to your upper body and lots of space for your spine to breathe. If you are diagnosed with scoliosis or are experiencing intense back pain, be sure to consult with a physician first before formally enrolling yourself in a class. Though these poses have been proven to aid in providing relief and healing to scoliosis, our bodies are all different and positive results are sure for with the proper guidance and properly executed poses. Learn more about tools to support your back and back health at our newly launched class for Better Back Health. Happening on Mondays, from 8:30 - 10:00PM, we are opening this class to adults and older teens who may have already been diagnosed with scoliosis or other back-related conditions that may affect mobility. 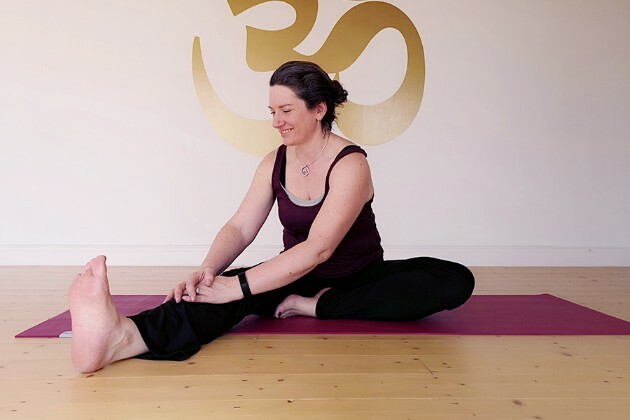 Also happening on April 6th, Teacher Joanne Bredin will be holding a Lower Backs Somatics Workshop. If you are experiencing tight muscles on your back, this Somatics workshop will lead you through a flow of gentle slow exercises teaching the back muscles to remember the ability to relax. Do not miss any of these opportunities. You deserve better. Your body deserves better. Your back pain ends here.